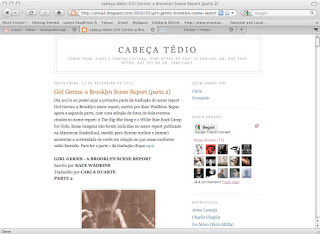 I am super psyched to report that Carla Duarte over at cabeça tédio finished translating GIRL GERMS: A BROOKLYN SCENE REPORT in Portuguese; Parte 2 debuted today. Carla writes, "I mean if I could translate to Spanish I’d totally do it. But I can’t, so I translated from english to portuguese to try to spread this new inspiring movement done by those girls. If I had more girls (or and boys) into this kinda thought I would start my own gang but the real thing is that there’s anyone like that around here. At least, I don’t know anyone. So, I can just do it by myself." 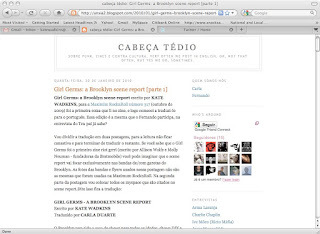 If anyone from Brazil is looking to start a girl gang, you should head over to cabeça tédio immediately and contact Carla. She rules! 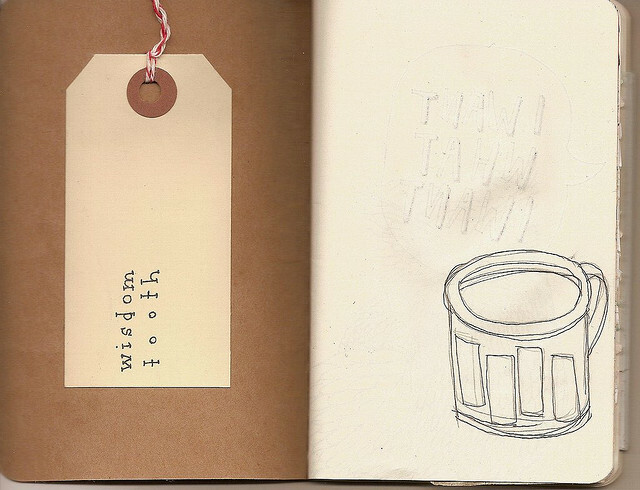 I know things have been sorta slow over here at WISDOM TOOTH, but I am just settling into the new year. For now, I have secret projects aligned with left-coastal riot grrrls, lots of For the Birds business, a Sarah Lawrence College women's history blog almost ready to hatch, a new idea for my Master's thesis, and some writing on contemporary masculinity. Tomorrow is the P.S. Eliot Living in Squalor 7" release show at my friend Lauren Measure's house! I'll post photos of the finished product once I have them.